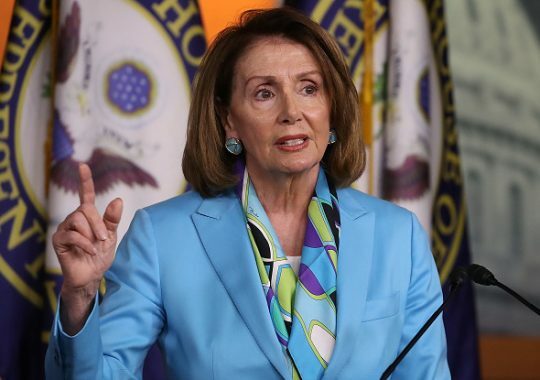 Democratic Rep. Nancy Pelosi (Calif.) has yet to take the speaker's gavel of the U.S. House of Representatives, but Democrats are already laboring to make it easier to dismantle the achievements of the Trump presidency. The incoming chairman of the House Rules Committee, Rep. Jim McGovern (D., Mass. ), confirmed to colleagues on Wednesday that he would not honor the three-fifths supermajority requirement to raise income taxes, as reported by the Washington Post. McGovern's decision overturns a rule implemented under outgoing Speaker Paul Ryan (R., Wis.) that mandated a three-fifths majority approve any proposed hike to the income tax. The change comes after a standoff between Pelosi and her moderate allies in the Democratic conference, such as incoming Ways and Means Committee chairman Richard Neal (Mass. ), and younger, more progressive members like Rep.-elect Alexandria Ocasio-Cortez (N.Y.). In November Pelosi and Neal initially proposed keeping the three-fifths supermajority rule for income tax increases "on the lowest-earning 80 percent of taxpayers." That notion, however, met stern opposition from Ocasio-Cortez and other progressives because it would severely constrain the ability of House Democrats to find new revenue sources to fund measures like universal health care and free college tuition. A number of progressive organizations that had been strong allies of Pelosi and the Democratic leadership broke ranks on the issue and sided with the progressive politicians. MoveOn, which spent more than $27 million this election cycle bolstering Democrats up and down the ballot, called Pelosi's proposal a "staggeringly bad idea." The organization made the announcement shortly after endorsing Pelosi's return to the speakership. In response to the rule change, Ronna Romney McDaniel, the chairwoman of the Republican National Committee, lambasted Democrats on Wednesday for prioritizing "more government" over the economic interests of the "middle class." "It’s barely gotten any attention, but Nancy Pelosi just made it easier for House Dems to raise taxes on everyone," McDaniel wrote on Twitter. "Not on the wealthy. Everyone." This entry was posted in Politics and tagged Alexandria Ocasio-Cortez, House Democrats, Nancy Pelosi, Tax Hikes. Bookmark the permalink.